Gourmet Garlic Gardens offers you a wealth of garlic information, as well as being an excellent resource for finding and buying unusual and exotic varieties of garlic direct from the growers. Click on the photos on the left to view information regarding the type of garlic shown. Scroll down to buy direct from growers . Above: "Burgundy Dream" An original digital artwork by Tommy Sellers. 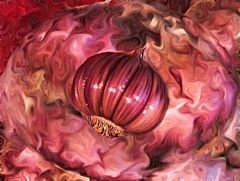 (Click photo for full size) *Burgundy - A Creole Garlic. Click on the ad above to find out more about each of our Garlic Farmers Market growers!